The Butler men’s soccer team had gotten out to a 5-1-1 start to the 2013 season, the program’s first as a member of the Big East Conference. Indiana University was 3-4-2, with three of its losses coming in overtime. Not stellar, but they were, in fact, the defending national champions. Ranked No. 23 in the nation, the Bulldogs were hungry for a big-time statement win on their home turf against a traditional in-state powerhouse. But the Hoosiers didn’t care, building a 2-0 lead early in the second half. And then the magic happened. In front of more than 5,000 fans at the Butler Bowl, the Bulldogs pulled off a stunning comeback under the lights. Senior Jordan Burt got the rally underway by scoring one in front of the goal in the 87th minute. Just 69 seconds later Vincent Mitchell sent a cross from the right side in front of the goal and freshman David Goldsmith sent a header to the bottom right corner, tying the game. The freshman wasn’t done yet. In the 104th minute, he flew in towards the left post and sent another header past goalie Michael Soderland, sending the Bowl into a frenzy. Butler head coach Paul Snape said that was a moment he will never forget. 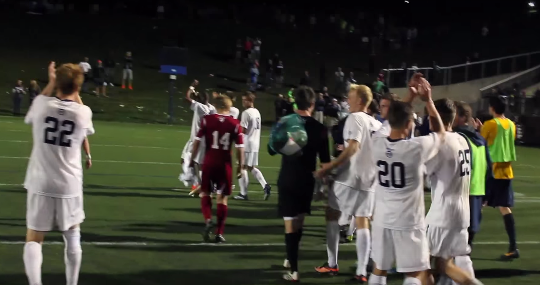 Butler went on to the Big East Tournament semifinals that November where it lost 1-0 to Marquette in overtime. The Hoosiers rebounded from a slow start to eventually qualify for their 27th straight appearance in the NCAA Tournament. After another appearance in the postseason last year, the Hoosiers are poised to make it 29 straight appearances, as they are ranked No. 22 in the National Soccer Coaches Association of America Top 25 Poll. The Hoosiers were unable to exact revenge on the Bulldogs last season when they played to a scoreless tie in Bloomington. They will again be looking to right their late-game meltdown when they pay a visit to Indianapolis Wednesday night. Kick-off is set for 7:30 p.m. at the Butler Bowl. The Hoosiers are 3-2-0 on the season, coming off a 1-0 loss at No. 13 Penn State University to open Big Ten Conference play. Butler is 3-0-1, fresh off a 4-0 rout of Drake University Saturday. Indiana head coach John Todd Yeagley said he’s got a young team, but he believes they have big things in store for this season. Yeagley said getting a win in Indianapolis Wednesday will be no easy task. Junior David Goldsmith leads the Butler men’s soccer team with three goals in four games this season. Goldsmith, now a junior, leads the team with three goals this season. He said the Hoosiers, as always, will be a tough matchup, but the Bulldogs won’t be backing down. But Goldsmith said he knows it won’t be easy to remain unbeaten. The Bulldogs and Hoosiers are even at 3-3-2 over the last eight meetings, including a 1-0 upset win for the Hoosiers in the 2009 NCAA Tournament when the Bulldogs were the No. 12 overall seed.